Tim Parkin: Can you tell us where the idea for the book started. 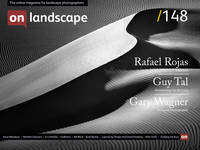 Rafael Rojas: I love photography books - as I think all photographers do. Now that I’ve walked the paths I have and I look back at my interests in film photography, platinum palladium printing, the dark room, the books, the paper… it’s like a revolt against the all encompassing digital world where everything remains in limbo and no one sees or touches or reads. I feel you lose some of the substance of photography in a way. This interest in the real substance of things has always been there and I think it has been shaping the way I do my own photography. So books, I realise now, are a logical step, and it’s something that had to be done in any case. This project was not a conventional one for me as it was the first time I’ve photographed the built environment. Nowadays I’m happy to do more things but at that time it wasn’t the case. Now I give myself the freedom to photograph what interests me but at the time I was very much into landscape photography - natural, the wilderness and all that. Which I still like a lot but Venice was something that came out of the blue. I think it’s the only city I like because it embodies this concept of time and it’s very surrealistic. You see the time passing by and this concept of time has been around many of my projects. Like death and going away, ruins and getting derelict. In some ways, time is something that has haunted me and I see that present in many bodies of work that are completely disconnected but you realise there are traces of time which are there. In answer to your question, I started approaching the project without any idea of doing a book at all. In fact, not even making too many photographs. I went with my Hasselblad and started photographing in black and white. It was at the beginning of when I had started using black and white film, and in a way, it was to discover how it worked and how I worked with it.